Popular opinion insists that I post more of Garcia's somewhat dubious reports and, in view of my promise to do so, I have to let you see his latest, ostensibly his review of the Turkish GP. You will understand my reluctance since it seems to have nothing to do with the race and, in fact, is just one of his elaborate excuses for being diverted along the way. Veracity I cannot speak for, the whole thing being conducted electronically and there being no documentary evidence therefore; I leave it to you, good readers, as to how much you choose to believe. Hey, Boss, have I got news for you! This is so good, I can hardly believe it myself - Garcia wins the scoop again! While you were watching the events in Istanbul over the weekend, I was busy getting the real dirt from the source of all wisdom in F1. And you know who that is, don't you? None less than the Great Flav himself, the maker of champions, the voice of reason, the visionary of the pit wall. But I get ahead of myself. Let me explain to you what happened. You remember that I fell in with my old mate, Fernando, during the Monaco GP? Well, the outcome of that was that Flavio invited me to sail over to Turkey with him on his fancy yacht. 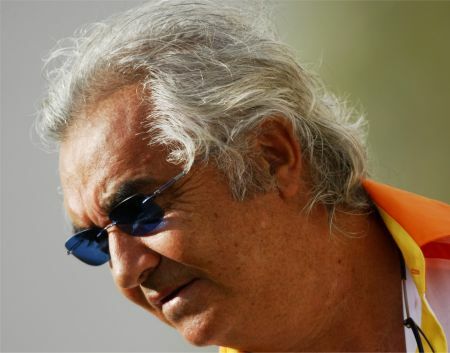 I had to cancel a few dates I'd made with local senoritas but with the prospect of the famous Briatore parties on the voyage to tempt me, I just couldn't refuse. My head still hurts. Anyway, to cut a long story short, it was a party that did for me in the end. I may have had a little too much to drink (I can't remember) but somehow I got into a huge argument with Flavio over some senorita whose name I never did find out and he insisted that I leave the boat at the very next stop. Well, I say "leave" but I think they dropped me overboard with a bunch of garbage, maybe to give me something to hang on to while I drifted to shore. All I know is I ended up floating in the Mediterranean with a bundle of papers under each arm. That is how I find myself writing this to you from an internet cafe on some Greek island or other. Don't ask me its name - I can say it but have no clue how to spell it. And I have before me one of those bundles of paper I mentioned; still a bit soggy but readable, I assure you. Lucky that I held on to it, Boss, because I found a screwed up document that will interest you greatly, I know. Looking forward to your announcement on Friday. Hot stuff, hey Boss? You gotta admit Garcia supplies the goods, even when he doesn't make it to the GP. Which reminds me - sorry about missing the Istanbul thing but this scoop makes up for it, I'm sure. Well, there you have it. You can understand now some of the problems I have with him, I'm sure. I can only suggest that his reports be taken with a large and proverbial pinch of salt and a disclaimer as long as your arm. Ah, Garcia! "The Accidental Bin Diver"- I can't wait for the book. He didn't mention seeing Piquet-lite doing a back stroke next to him did he? Steven: Thanks duly passed on (I swear he'll be getting a swollen head). Like you, I thought Mosley was being a bit "diplomatic" in his summary of FOTA's response. I may be able to give even more credence to Garcia's report. - I was chatting to a chap on the Clapham omnibus the other day and he said that his neighbour knew a man who once worked in the local garage (in Clapham), but had been fired for turning back mileometers; No matter, the fired chap concerned in his turn had been down the pub and had told the barmaid that he reckoned he had heard from his cousin in Italy that Ferrari made excellent racing cars and next year they planned to win races! I wish I had taken a contact number from the chap (on the bus) so I could question him further. He obviously had a finger on the pulse of F1.